The Queen Anne style can be traced back to the British architect Richard Norman Shaw, who specialized in a revival, half-timber style that was incorrectly assumed to date back to the reign the early 18th-century Queen Anne. Historians later recognized that the style derived instead from the Elizabethan and Jacobean eras—almost one hundred years before the reign of Queen Anne, but by then it was too late. The term "Queen Anne" had stuck. The Queen style was introduced to American architects in the mid-1870s, when the famous American architect H. H. Richardson adopted it for his well-to-do clientele's massive sea-side cottages, such as the banker William Watts Sherman's summer home in Newport, Rhode Island. American Architect and Building News--a professional magazine for architects--featured homes in this style in the late 1870s. However, the style really took off in the mid-1880s, when two things happened. First, the price of nails continued to drop, making balloon-frame construction possible. And second, the New York City printer Robert W. Shoppell and the Knoxville, Tennessee, architect George Franklin Barber began publishing influential mail order catalogs, booklets and magazines full of architectural plans and views of homes in the Queen Anne style, including massive houses that they referred to demurely as "cottages" or "modern houses." Local architects could show these catalogs to prospective clients and discuss with them various price points and options for customizing the plans. Both builders and clients quickly recognized the adaptability of the style, which allowed for endless variation of asymmetrical floor plans, complex roof designs, and a wide variety of applied decoration. On the exterior of Queen Anne homes, the only rules seemed to be that the home owners should contribute to the attractiveness of their communities by building the largest possible houses with as many irregular surfaces as possible and not repeat of the design of any other house nearby. They did this by adding projecting porches, towers, and bays and by recessing areas of walls to make room for verandas and niches. Because of the availability of inexpensive factory-made nails at this time, architects were free to arrange rooms of varying sizes without consideration of how the rooms would fit within boxy timber frames. This assortment of variously contrasting surfaces would allow the owner to apply to the exterior of the home the maximum amount of variously contrasting materials. Space could easily be found somewhere on these structures for exciting new decorative elements that in a previous era would have seemed exceedingly labor intensive, technically impractical or otherwise costly. These included scroll-cut verge boards (first introduced in designs for Gothic Revival homes), lathe-turned spindle work (which made possible rows and rows of neatly carved, identical sticks for the era’s pervasive wrap-around porches), and wooden shingles trimmed at the factory to allow designers to create a wide variety of patterns—the most popular resembling the scales of a fish. Windows became an important component in Queen Anne design, too, as large panes of factory-made clear glass made possible huge picture windows, which were often bordered by smaller panes of leaded, etched or stained glass. These decorative elements could be shipped across the country (sometimes around the world) from specialized factories and added by local builders to a wide variety of local building materials, including wood, stucco, glazed and unglazed tile, slate, brick and stone. This was an eclectic era, sometimes referred to as the Victorian age, in which individuality was measured by one’s ability to assemble large quantities of diverse things—both hand crafted and mass produced—in an original way. Consistency, historical accuracy and restraint were considered to be unnecessary and even un-modern. These homes also expressed the owner’s modernity by containing all the latest conveniences that they could afford including, by the end of the century, running water and electricity. All of this complexity generally required builders to employ the services of an architect. 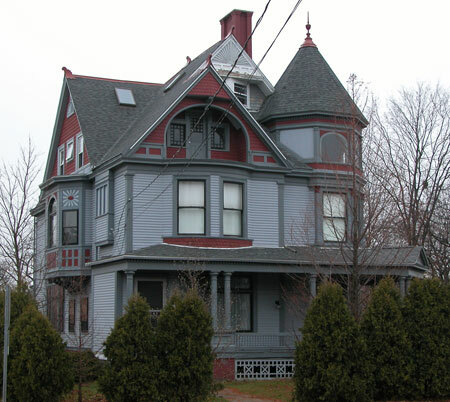 In Adrian, the Queen Anne style is closely associated with the architect and builder Christian Frederick "Fred" Matthes (1854-1910), as well as carpenters Leonard Beck and Andrew Vogt, who designed homes for many of Lenawee County's wealthiest families in the 1880s and 1890s--making sure that the exterior details of each home varied from all the others. Interiors of these buildings, too, were often finished with the finest materials and craftsmanship. At the peak of the Queen Anne style's popularity, Matthes proudly offered his services as "architect and builder and general contractor" in the 1897 Adrian city directory, taking out a full-page advertisement that featured a photograph of the Presbyterian Parsonage at 435 Dennis Street. His Thompson House in Hudson, Michigan, is a choice example of one of his finer homes; it is now a house museum and open to the public. By the turn of the century master carver and designer Fernando D. Thieme, who started his career as a finish carpenter for the Peninsular [Railroad] Car Company in Adrian, was designing furniture and supplying exquisite decor for some of Adrian's finest homes. Raymond-DeMots House, 449 State Street, 1895-1902 Designed by architect F. E. Smith. Click here for an essay about the Raymond-DeMots House by Amy Garno Anderson. Of course modern families of more modest means could build Queen Anne houses, too. But their homes were less likely to involve the services of an architect or master carver. Their homes tended to be boxier and simply had less of all the above. Still, even modest homeowners could contribute to the beauty of their community by adding complex roofs that usually combined hips and gables (this combination roof alone qualifies a home as Queen Anne—a quality that is enjoying a revived popularity today in suburbs across America). And the gables of even the most modest Queen Anne home would almost certainly be decorated with applied half timbers or factory-made shingles. Additional resources would allow them to apply additional features such as verge boards, wrap-around spindle-work porches and an interesting window or two. The Queen Anne style would continue to be popular until the First World War (1914-1919, when more than 8.5 million soldiers lost their lives), which was an even more sobering event for this ostentatious culture than the economic depression of 1893. (Interestingly, Adrian seems to have weathered the economic turmoil of the 1893 depression unscathed, thanks to the city's prospering wire fence industry.) Moreover, as professional architects increasingly received academic training during this era, the tide turned against Queen-Anne eclecticism and toward historical authenticity, consistency and restraint associated with the Colonial Revival, Foursquare and Craftsman styles. Click here for a photograph of the Robert Gilliland House with its original tower by photographer W. W. Dewey from the late 19th century. According to the Adrian Times & Expositor, December 12, 1892, p 3, this house was built by C. F. Matthes for $5,000, one of three houses built for this price, the most expensive homes built in the city that year. Clay was bookkeeper at his father's Frank W. Clay's bank, Waldby & Clay's Bank. Click here for a photograph of the building as it appeared in the 1970s. And click here for a reproduction of the house in 1903. According to the Adrian Times & Expositor, December 12, 1892, p 3, this house was built by C. F. Matthes for $5,000, one of three houses built for this price, the most expensive homes built in the city that year. The front porch was removed after 1939. According to the Adrian Times & Expositor, December 12, 1892, p 3, this house was built by C. F. Matthes for $5,000, one of three houses built for this price, the most expensive homes built in the city that year. Click here for an image of the house from 1903. Designed and built by Adrian architect C. F. Matthes for $3,000. Click here for an image of the house as it appeared in 1903. Click here for a c. 1890 photograph of this building by W. W. Dewey (courtesy of the Lenawee County Historical Museum). Designed and built by Adrian architect C. F. Matthes. Click here for an essay about the Presbyterian Manse by Alicia MacGeorge. Click here for an image of the Presbyterian Parsonage from 1897. Designed by architect F. E. Smith. Click here for an essay about the Raymond-DeMots House by Amy Garno Anderson. Click here for an image of the house in 1907.